Okay, hello – that was a classic: short and snappy, with steady pressure on the legs, especially as we rode up Waba, Campbell Side Rd, and Bellamy; then the rollers (both ways) on Peneshula Rd. But, we weren’t done yet. We had to climb over to and out of Burnstown, first. All in all, you can’t beat that for a full-on training ride that had a bit of everything, including a fast pace (aided by a tail wind) on Campbell Dr, as we rode for glory towards the overpass. You just should have been there. It wasn’t all good, however; there was no coffee stop. Now, that’s a no-no. Well, we did stop for a photo at the Neat Cafe but it was closed. That was the story of the long weekend – everyone’s on holiday, except the mafia! Still, I hope you enjoyed the ride and the company. It’s a great group, and we had very nice conditions. The wind, early on, was not a factor for a change. Thank goodness. We’ve had one too many gusty rides. I said gusty, right. 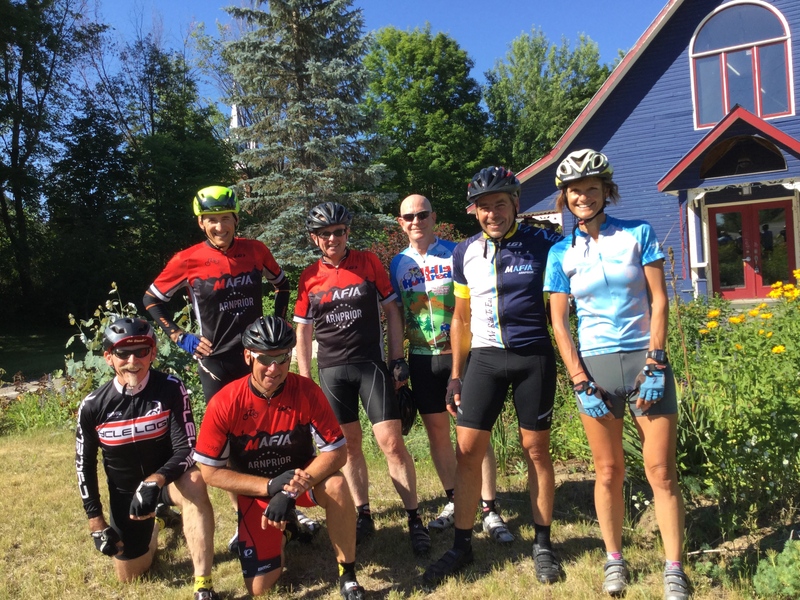 If you missed this weekend’s rides, there is always next Saturday and Sunday. Why not join us for friendly banter on the roads of Renfrew County. For non-subscribers, if you wish automatic updates, click on the ‘Follow’ link at the bottom right of the Home page. It’s that easy, and no cost. What a bargain! New cyclists welcome. PS: don’t miss to-day’s special tweet.